We stand on the edge of history, looking toward a future of limitless possibility and potential. No, this isn’t the announcement for some grandiose tech innovation but it still holds the same weight to many of us so I’m here to give you all a primer on what you can expect! 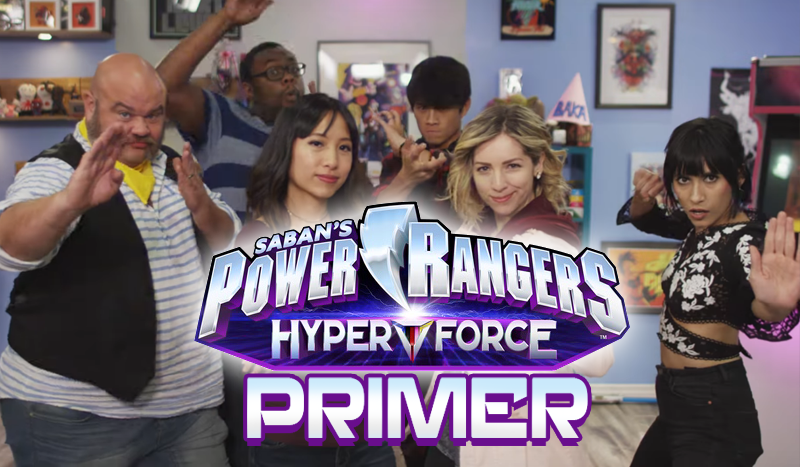 Power Rangers Hyper Force, a collaboration between Saban Brands and Hyper RPG, airs tonight at 6pm Pacific Time (1am Greenwich Mean Time) on Twitch. Starring PR alumni, YouTube personalities, and Voice Actors, this 25-episode adventure will see a brand new team of Power Rangers do battle across time against the forces of evil and oh, boy, am I ever excited. Not only is the Hyper Force team wholly unique to Power Rangers but it is also a sequel to one of the most beloved series in the franchise; Time Force. Set in the year 3016, this RPG adventure sees a class of Time Force cadets under the tutelage of Jen Scotts (played by a returning Erin Cahill) and will consist of the team going on adventures throughout Power Rangers history. That is immensely cool and very thematically appropriate for the upcoming 25th Anniversary. Naturally, you can’t have a Ranger team without suits and Hyper Force does not disappoint. Designed by Hyper RPG and Peter Sudarso himself, the suits have a very unique feel, paying homage to Rangers past while being consistent with the Time Force theme. The Greek Titan theme is cool because of the connection to mythological interpretations of Chronos/Cronus. The cast is not only an interesting bunch but also includes some exciting prospects. We have Peter Sudarso trading in his Ninja Steel Blue suit for Hyper Force Red, playing the Captain Marvellous-inspired Marvin/Marv. The YouTube personality Meghan Camarena (aka Strawburry17) playing Chloe, the Hyper Force Pink Ranger. Power Rangers super-fan Andre Meadows (aka Black Nerd Comedy) plays the Blue Hyper Force, Eddie. Sailor Mars/ Miraculous Ladybug voice actress Cristina Vee as the franchise’s first female Black Ranger, Vesper, and last, but certainly not least, is the big man himself — Paul Schrier aka Bulk as Jack, the Yellow Ranger. HE FINALLY DID IT! Paul gets to be a Ranger! If nothing else, I’m tuning in for him but the rest of the cast are no slouches either so we should be in for a very entertaining series! As I said, Power Rangers Hyper Force is a card-based RPG that utilises D6 dice for decision making. Under the watchful eye of game designer and Games Master, Malika Lim, this live show will feature an element of audience participation with the Twitch chat viewers able to lend energy to their favourite Rangers to perform actions and even have their own Ranger avatar to send on missions. It’s an interesting mechanic to add into the game and could easily break it if the audience keeps the Rangers stocked or even overflowing with energy points but Hyper RPG did mention that the system will be balanced if this occurs. Overall, there’s a lot to be excited about here. With an all-new, all-different team of Rangers, a brilliant cast, and audience engagement, Power Rangers Hyper Force is shaping up to be a very interesting entry into this storied franchise and I, for one, cannot wait to cheer them on! You can catch the first episode of Power Rangers Hyper Force tonight (Tuesday 24th October) at 6pm PT (1am GMT) on Hyper RPG’s Twitch channel or a week later on their YouTube channel. What are your thoughts on Power Rangers Hyper Force? Excited to have a brand new team? Hoping to see returning Rangers? Let us know in the comments below!